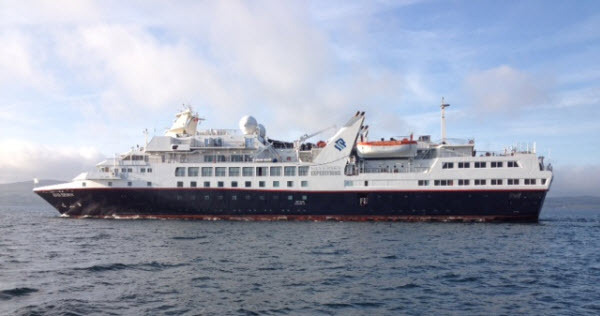 Silversea’s purpose-built Silver Explorer expedition ship is visiting Glengarriff bay this morning. She has been designed specifically for navigating waters in some of the world’s most remote destinations, including both of earth’s polar regions. Equipped with a fleet of Zodiac boats the guests can visit even the most off-the-beaten path locations and an expert Expedition Team provides insight and understanding of the destination – so they are in for a treat this morning! The ship is over 100m long and carries 132 guests and a compliment of 117 crew. The 81-metre long super motor yacht ‘AIR’ paid a visit to Glengarriff Harbour and moored off Garnish Island this week. It was quite a spectacle to see. AIR was launched last year and it is available for charter at the reported rate of €750,000 per week! Built in the Koninklijke De Vries yard in Holland, AIR has a sleek and elegant exterior with modern lines, a unique matte black steel hull, and an aluminium superstructure. She measures 265.7 feet in length and has a beam of nearly 39 feet. AIR has a helicopter pad complete with helicopter in case you need to pop out for something! The vessel can accommodate 12 guests in 7 roomy staterooms including an impressive split level owner’s suite, two guest cabins on the upper deck, one cabin on the main deck, and three on the lower deck. The owners’ observation lounge offers a breathtaking view over the eight-meter long pool on the main deck’s forward area.